Subaru dropped another Impreza concept on us at the Los Angeles Auto Show on Wednesday. The company says it will be the first example of its next-generation vehicles, which will be using a modular platform. We've seen this concept evolve for a few years now. We first saw the WRX concept in New York in 2013, then we saw the five-door Impreza concept in Tokyo earlier this month. With each showing the car gets a little bit closer to production. The new Impreza wears the company's "Dynamic x Solid" design language, which Subaru says "not only hints at the new Impreza design, but also future models." We don't have too much to go on here. Subaru says it improved aero performance by blending style and function; the front gets the hawk-eye headlights and a hexagonal grille, the flared fenders increase the visual width and 19-inch wheels sit flush with the wheel arches. In back, character lines flow to the taillights, which now share the same basic styling as the headlights. The new Impreza concept is about an inch shorter in length than the current car, an inch and a half wider and the roofline is a half inch lower. It gains one inch in wheelbase as well. Subaru just revamped the engine lineup for the Impreza/WRX/STI family, so we'd assume the Impreza will continue with a 2.0-liter, 148-hp four and all-wheel drive. WRX and STI models will get turbocharged fours making either 268 hp or 305 hp. We asked Subaru about when we might actually see this car in production -- we'll update when we hear back. The colors should seem familiar. A base coat of "World Rally Blue Pearl III" along with trendy fluorescent yellow trim, as a nod to the WRX's World Rally Championship heritage. Looking at what numbers we do have, it is clear this WRX is intent on blazing a new performance trail. The new car loses two-inches of its length (178-inches), is almost four inches wider (74.4-inches), and ? get this ? the new car drops four inches of stature to 54.7 when compared to the 2012/2013 model. Finally, the wheelbase extends a massive five inches to 108.7. (The 2012 WRX 4-door sedan measured 180.3-inches in length, 70.70-inches in width, 58.1-inches in height with a 103.3-inch wheelbase. You know what else has a 108.7-inch wheelbase and a carbon fiber roof? The current BMW M3. Subaru claims it's a coincidence, but I'll just leave that there, along with this: outside of the futuristic headlights, the streamlined side-mirrors and the funky taillights, what you're looking at is what we believe is the an only lightly-camouflaged, production-ready 2015 Subaru WRX. Excited yet? 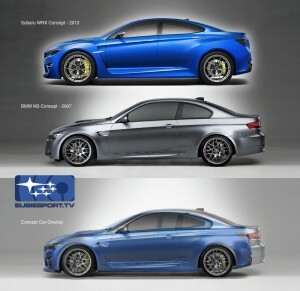 Finally, there have been some questions about future STI versions of the WRX. Michael McHale, from Subaru of America put our concerns to rest by flatly saying that, "An STI will happen." We can't wait. Subaru's new XV Crosstrek will be here before you know it! We have one due in close to the end of October in Tangerine!! If you would like more information on this vehicle or any of our others shoot us an email!